Hi loves! How are you today? Glad it is weekend? I have 2 more weeks left to work and then it is vacation time, awww yeeeeaaah! Can't wait ♥. The manicure you are looking at today is a combo of El Corazon Kaleidoscope T-28 (a thermal) and Shimmer Airriann. I used Duri Rejuvacote as my base and Essence BTGTS as my topcoat. El Corazon Kaleidoscope T-28 is as I said a thermal polish and it shifts from a nice bright red shade (hot) to a dark brownish brick shade (cold). It applied very easy, nice formula, and it dries to a rubbery matte finish. I didn't use topcoat in between because I knew I'd top it with the glitter but I am sure it'll look nice and shiny after topcoat! The color transformation is quick. You dip in your fingers in cold water (I had a little cup filled with water and icecubes) and it immediately changes. I had a hard time getting the 2 shades on my nails at the same time, the moment I wore this it was very hot here so my nails warmed up real quick. You can also check this little video. Next, I topped it with Shimmer Airriann. 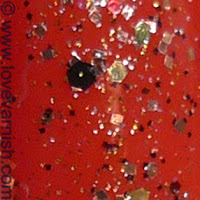 This lovely glitter is packed with gold, red, black and more colors and applied very easy. All Shimmers are so nice to work with! I chose to layer 1 coat over my base to let the thermal still show through. The glitter looked nice both on the hot and cold color. I really liked the combo of both polishes and I enjoyed my first thermal polish! What do you think of it? And what is your favorite thermal polish? El Corazon can be bought by sending an e-mail to ELCorazonzakaz@gmail.com. I do not have any idea of the shipping costs or the price per polish unfortunately. Shimmer can be found in the Etsy shop hosted by Cindy, the lovely creator behind these sparkly beauties. There is also a Facebook page and a Twitter account to connect with. 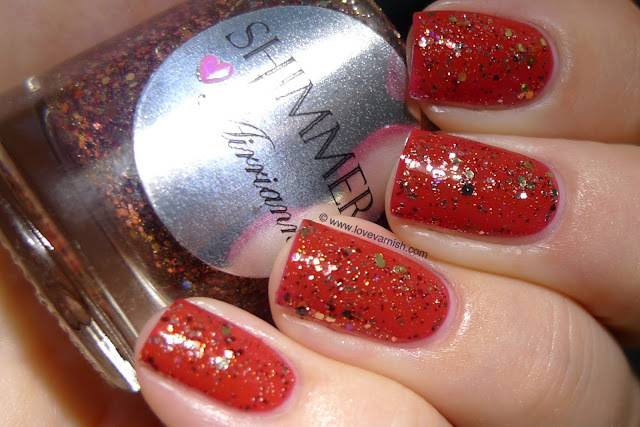 Shimmer Polishes retail for $12 a bottle. Nice polish and I liked this combo. I don't own any thermal polishes yet. Thanks Tiina! If you come across some, try it! It's fun :).